When we returned from the boat to Phoenix in early March because of Paula’s swollen knee, we hoped we could find out quickly what was causing it, get it fixed, and resume our 2nd Great Loop. It was not to be. After 9 weeks and 9 doctors at home, there was no diagnosis other than “inflammation” and no one had determined a cause. She finally had to resort to cortisone shots, which at least helped in the short-term. But…all that meant we were so far behind where we should have been on our Great Loop that we had to make the decision to find a safe haven for Life’s TraVails during hurricane season and call it quits until November 2017. 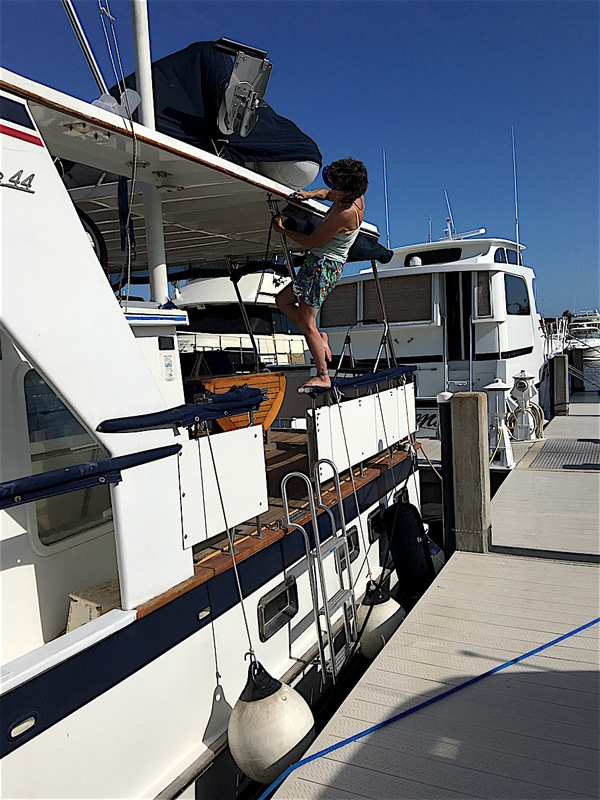 While Paula stayed home recuperating, Tom went back to the boat at Longboat Key on May 9 to catch up on some routine maintenance. 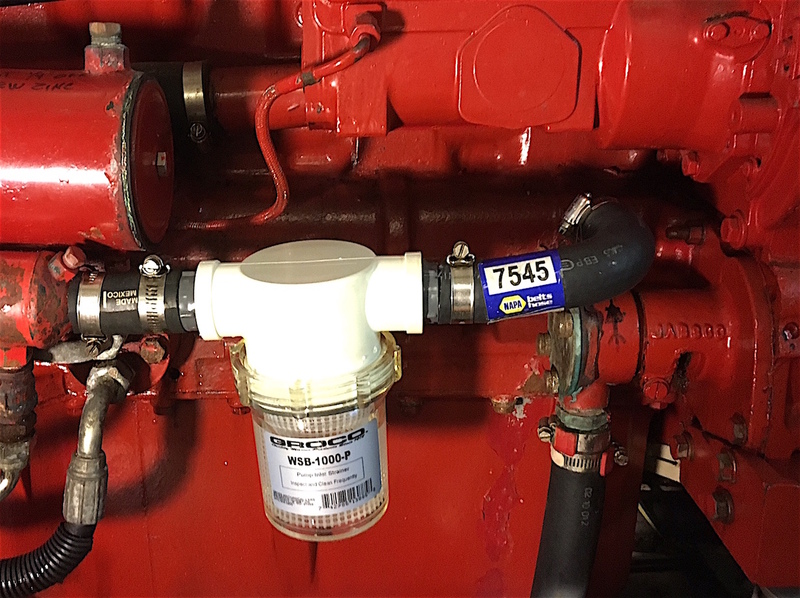 He also installed a strainer on both engines’ raw water lines between the impeller and the heat exchangers. Hopefully these “impeller catchers” will catch any broken pieces of impeller, which is what caused our port engine to shut down and required the replacement of one of the pistons last May. We took 10 days to get some long-overdue boat work done. Tom sanded, primed, and painted the toerail. We had previously decided it would be easier to paint the teak than try to match it after an 8’ section had been damaged during a haulout. 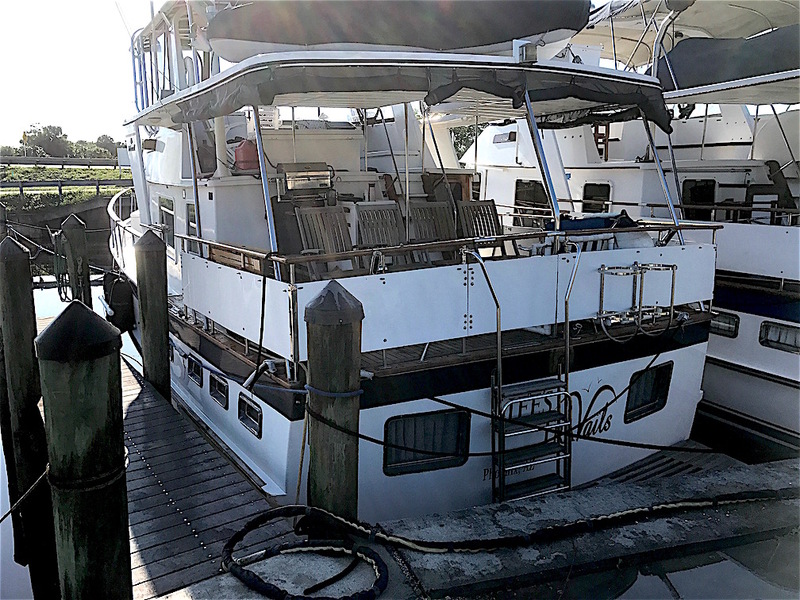 Meanwhile, Paula scraped, sanded, primed and painted the teak trim around the flybridge and dinghy deck. (Again, we leaned toward painting for easier long-term upkeep.) Twelve hours were required between each of 2 coats of primer and paint, so after all the prep work was done, the painting took 4 days. Each coat went subsequently quicker, which was good as the daily temperatures climbed subsequently higher. 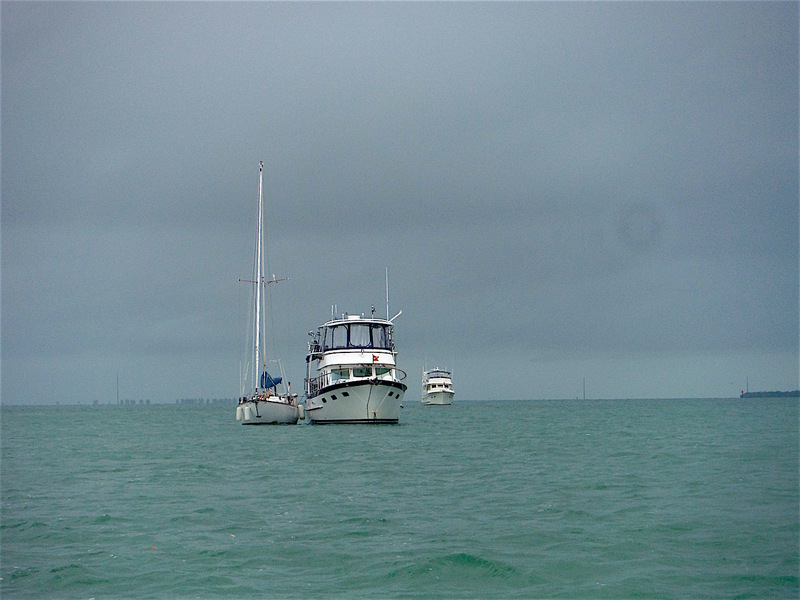 The last few days we were in Sarasota, afternoon thunderstorms hampered our efforts to prep the boat for departure. 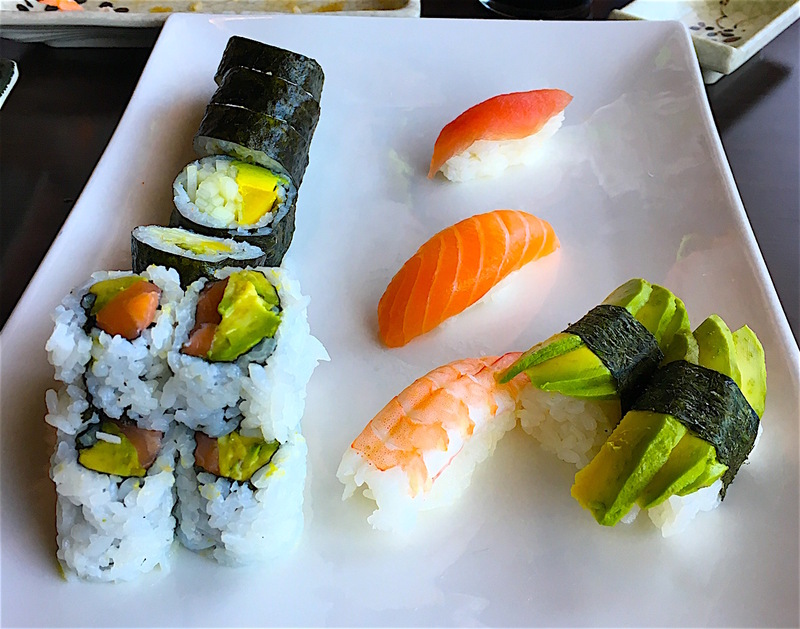 We enjoyed a few meals out, finding Yuniku (“unique, cool”) endless sushi buffet and the wonderful Der Dutchman Amish buffet (where we ate twice). Paula enjoyed the camaraderie of Kerri Wenum and Mandy Peterson of the marina’s Naughty Nitters group one afternoon and also a trip to her favorite Sarasota knitting store. 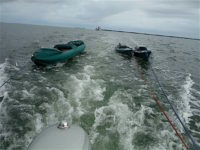 On June 3, the Wenums helped us loose the lines and we began a leisurely transit to Ft. Myers. Though it was only 92 miles, we had decided to take 3 days (which actually turned into 4 due to weather). The first day, our speed was only 4 to 5 knots compared to our normal of 7 and Tom wondered if the props were fouled with barnacles. While admiring the beautiful houses along the ICW, we heard Mystic on the radio calling one of the bridges. 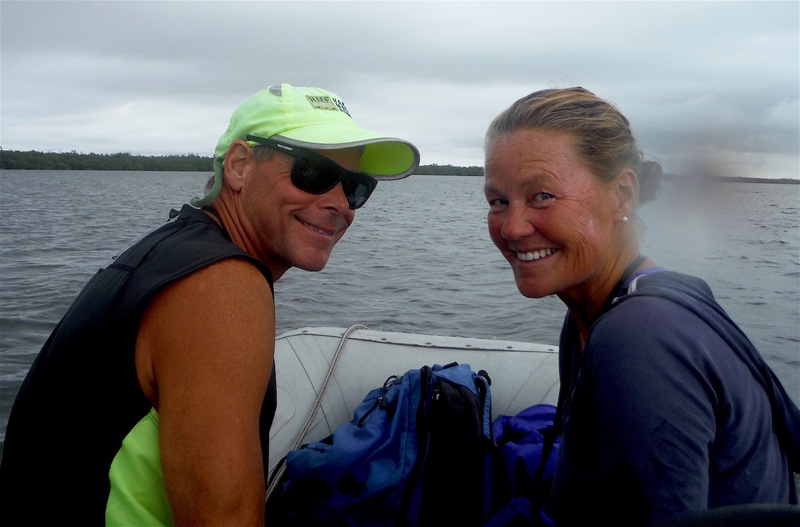 We knew Dave and Beth Rogers, also Loopers, had left Tarpon Springs a few days earlier but did not know exactly where they were. A quick phone call revealed we were only a few miles apart! About an hour before we reached Englewood’s Lemon Bay anchorage, our port engine overheated and Tom had to shut it down, decreasing our speed even more. 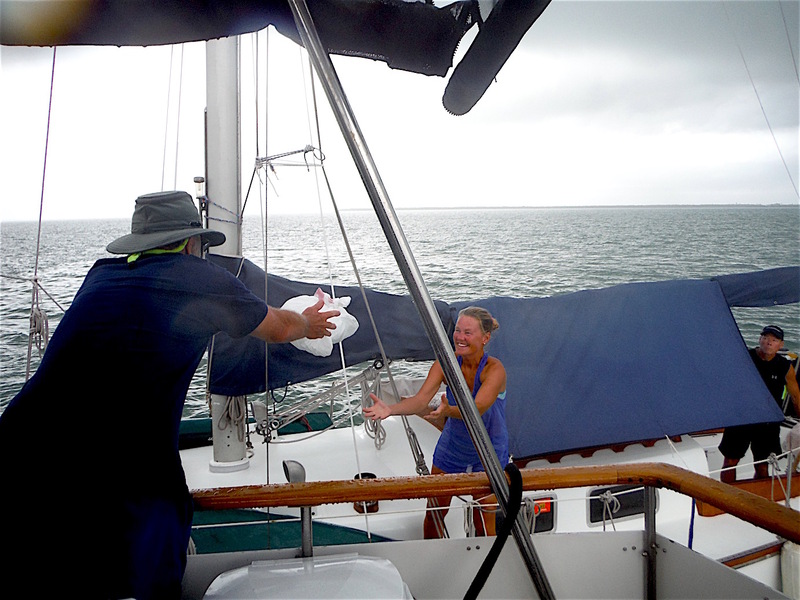 But once we arrived at our anchorage, we rafted up with Mystic and enjoyed catching up. We just love how we keep intersecting with friends on the Loop. In the morning after smoothies and bagels on our aft deck, Dave and Beth kayaked to town while Tom dove under our boat. Our props were indeed very fouled with barnacles and Tom scraped for about an hour to clean them. As we pulled up our anchor to depart, the Rogers returned with tools ready to scrape their boat bottom and we decided to raft together again that evening at Cayo Costa. Along the way, our speed and engine temps were back to normal (yeah!) and we saw about 24 dolphins. Tom had determined Cape Haze had the best diesel price nearby ($1.99 per gal), and we stopped for fuel. It was a very tight marina – narrow fairways with two 90-degree turns to get to the fuel dock. Had we known what we were getting into, we might not have stopped. Paula, having not driven the boat in 3 months, was super-nervous anticipating our exit which required backing up about 40 yards in a narrow fairway with boats on one side and rocks on the other. Fortunately there was no current and very little wind. There was, however, a lot of praying going on until we returned to the main channel. The approach to the anchorage at Cayo Costa was shallow, but we did it twice to find the best path for Mystic, which drew a foot more water than our boat. It was a lovely, quiet anchorage and we finished the evening with chef Tom’s delicious grilled salmon accompanied with fresh veggies and Beth’s light quinoa salad. We were really enjoying the slower pace. Unfortunately, we awoke in the morning to pouring rain. 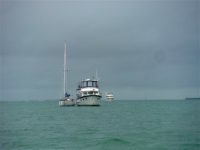 Around 11:30, we finally gave up our plan to kayak to shore to explore Cayo Costa and hoisted anchor in a light rain. 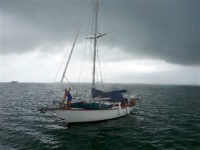 We boated for about an hour until black sky, decreasing visibility, and small craft advisories caused us to turn around and seek shelter behind an island to wait out the worst of a 350-mile storm in the Gulf which stretched along most of Florida’s west coast. (Watch a video of the storm shot from Mystic on Dave & Beth’s Facebook page.) Several hours later, we continued to Sanibel Island and anchored off Ding Darling Park, a spot we had eagerly anticipated, having been there on our first Loop. In the morning, the sky had cleared a bit. 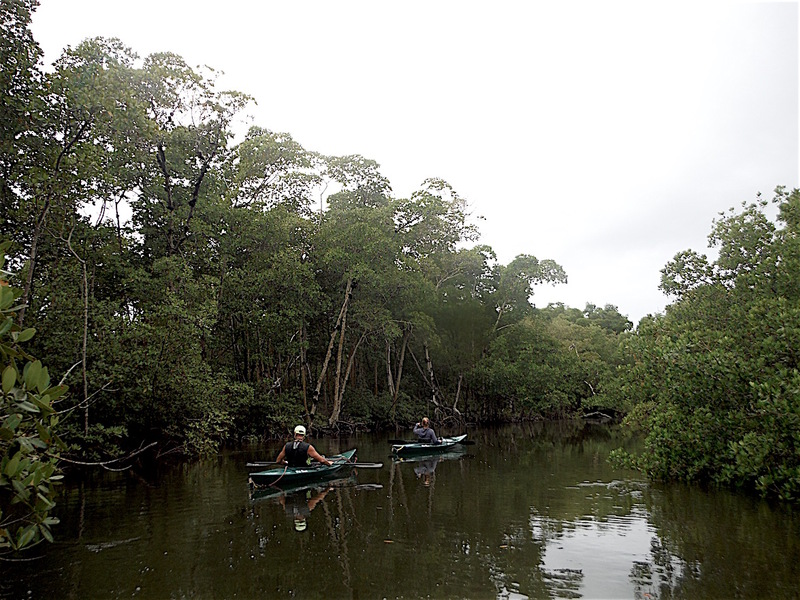 Tom tied our tandem kayak and the Rogers’ 2 kayaks to our dinghy and we made our way to the Ding Darling Kayak Trail. We hoped we had not “built up” the kayak trail too much to the Rogers’ who were avid kayakers. The gentle current almost made paddling unnecessary as we entered the trail, and Dave spied a raccoon eyeing us carefully as we drifted by it. We spent about an hour lazily winding through the trail and were quite pleased when, at the end, Dave said it would be one of the highlights of their Great Loop. 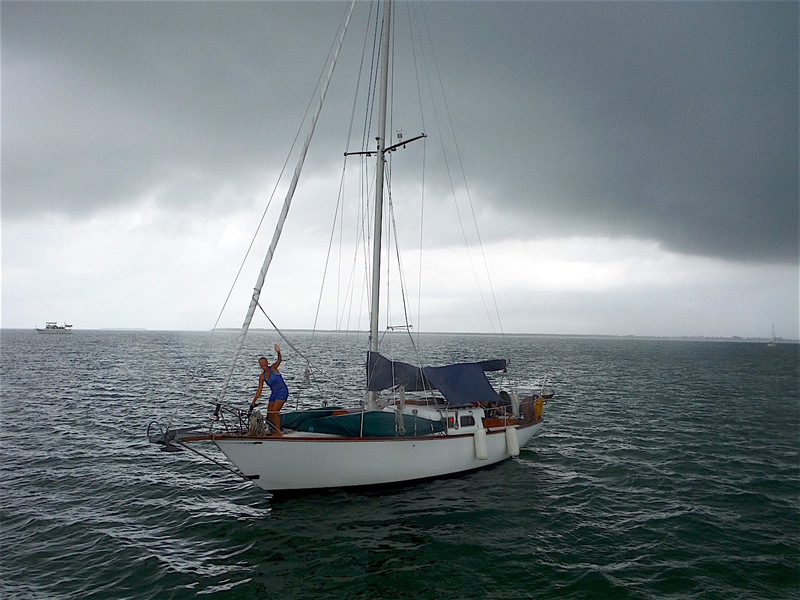 We waited out another rainstorm before we could lift anchor. After lunch, we gave Dave and Beth some ice, said goodbye, and headed toward Ft. Myers. We turned off the ICW and headed east on the Okeechobee Waterway (OWW), beginning at mile 149 and counting down. Again, there was intermittent rain along the way and we parallel parked along the face dock at Sweetwater Landing (OWW126) just before we were hit by another downpour. It was unfortunate that we couldn’t put Life’s TraVails in her “permanent” slip for the winter, as there was still an incapacitated boat in it that was supposed to leave days earlier. Our schedule required us to go home and Tom would have to come back down the following week to move our boat into the slip. The next day we began preparing to head back to Phoenix. Unfortunately, there was still more torrential rain, and the outside washer/dryer at the marina failed twice. (Paula finally had to bum a ride to a nearby laundromat to finish the loads.) The dockhands said they had never seen the water so high at the fixed docks. Some areas in the Gulf had 7” of rain in one day with 50 mph winds. We were glad to be at the marina safely secured. Tom returned to the boat for 4 days the following week. 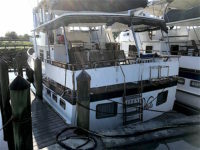 While there, he moved the boat to her summer home and secured her with double lines everywhere “just in case.” It was the first time Tom had docked Life’s TraVails in over 2 years and he was very pleased he didn’t hit anything, especially since it was a very tight slip! While there, he had another mechanic look at the generator and they decided to remove the injectors and have them rebuilt before moving on to something more drastic. Hopefully, the injectors will turn out to be the problem. He also spent time in and out of the rain caulking the front windows (for the 3rd time since we have owned the boat). Life’s TraVails is now parked snuggly right next to another DeFever 44, Maya. Kindly, the owner’s father, Greg, delivered Tom to the airport the next morning for his return home. “Bum a a ride to the laundromat”??? Your wife (Paula) was very charming and I couldn’t resist in helping out. Also I enjoyed your visit at my boat in the pouring rain discussing the Great Loop. “Sweet Melissa” with a name change to Euraquilo: A tempestuous NNE wind!